Technical Car Experts Answers everything you need: How to replace Adjustable Camshaft timing solenoid on Mercedes Benz? How to replace Adjustable Camshaft timing solenoid on Mercedes Benz? You can find the solenoid on the front of the head. If it is still an OEM part, it looks like the bottom of a black cup. It will be a gold color if it's been replaced in the past. It will have one plug in it with two wires coming out of it. You have to buy Mercedes black sealant when reinstalling the new one. 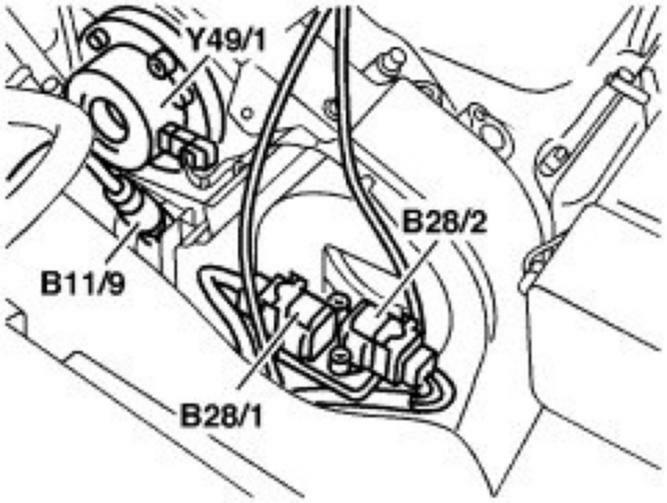 The code p1533 for the left side camshaft timing solenoid electric fault. Its a common problem and you need to replace the left side solenoid. The adjustable camshaft timing solenoid is actuated in line with the map directly by the ME-SFI control module with a D.C. voltage (not pulsed). Unbolt solenoid (Y49), bolt on. Coat solenoid (Y49) sealing surface with sealant 002 989 47 20 10. Tighten M6 x 16 bolts (1). Armature (4) can be fitted onto control plunger (18) only in fixed position (arrow). CAUTION: It is not permitted to re-use the bolt (3). NOTE: The armature (4) together with the control plunger (18) must move freely from stop to stop after the nut (6) has been tightened to the specified torque of 65 Nm. CAUTION: For operational reasons, the different versions of the armature (4) and of the solenoid (2) must only be installed in the specified combination (see table below for matching). There are only three allen bolts that hold each solenoid to the front of the timing chain cover (up on the heads). Internally, the solenoid is not connected to anything... remove the three bolts and it comes right off. Crankshaft and camshafts timing marks? dual over cam timing mark details? Camshaft, Bearings & Lifters Replacing ? Camshaft Position (CMP) Sensor replacing? How to service Cam Shaft? Camshaft servicing? How to replace Camshaft? Replacing Vehicles Cam Shaft Assembly?